Mustang Floor, Guitar Amp Simulation Pedal from Fender in the Mustang Amp series. 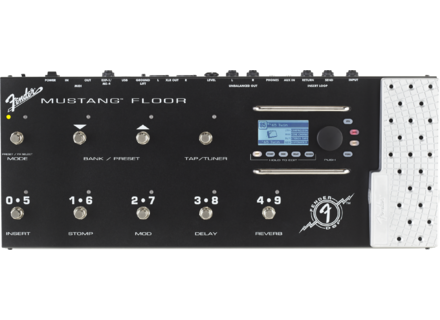 Fender is announcing the debut of its first-ever multi-effects unit, the Mustang Floor. The Mustang Floor is a floor unit designed for a variety of applications that puts about three dozen digital effects at your feet. The Mustang Floor is also a modeling preamp with low-impedance speaker-emulated outputs for running direct to a PA system, a modeling preamp with line-level outputs for use with a power amp and speakers, a silent practice system with stereo headphone output and auxiliary input perfect for playing along with an iPod or other media player, and a tone machine for direct-to-digital USB recording. Mustang Floor features include nine footswitches and a solid aluminum treadle-style control pedal, Mustang III control panel and LCD window, 12 amp models, 37 effects, 100 onboard factory and user presets, “individual stompbox” mode in which amp models can be bypassed, headphone output and auxiliary input, dual XLR and dual ¼” line outputs with level control (outputs can be programmed for optimal response with PA system, power amp or guitar amp, according to Fender), chromatic tuner, and USB connectivity for low-latency audio output and interface with free Fender FUSE application. The Fender FUSE software, included as a free download, offers on-screen parameter control, deep editing, “hidden” parameters, unlimited preset storage, firmware upgrades and additional free content from Fender, Fender artists and other users. [NAMM] Fuchs 4-Aces & Full-House-50 Fuchs Audio completes their Casino Series of guitar amps with the introduction of the 4-Aces and Full-House-50 heads and combos. [NAMM] DiMarzio Mark Morton Dominion Humbuckers DiMarzio has released the new Mark Morton signature Dominion Neck and Dominion Bridge humbuckers. [NAMM] Peerless Maestro & Virtuoso Guitars Peerless Guitars announces at NAMM 2012 the release of two Dr. Martin Taylor MBE signature models: The Maestro and The Virtuoso.